The story of Thor’s fishing trip is a popular subject in Norse literature and art. It appears in the Poetic Edda and the Prose Edda, in poems by Bragi Boddason and Úlfr Uggason, and in manuscript illustrations and stone carvings. The characters in the tale are Thor (god of thunder), Hymir (giant), Himinhrjód (giant ox), and Jörmungand (giant sea-serpent). Clearly, this is a tale dealing with larger-than-life forces. Mythology is often a metaphorical way of looking at natural phenomena; in older cultures, myth plays the role later acted by science. The very nature of mythology leaves it open to multiple forms of interpretation. Through close reading, it is possible to decode this particular myth as a mythopoetic explanation of meteor phenomena. 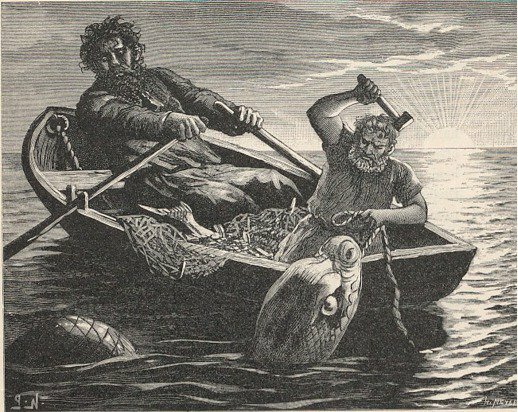 Before Thor rows out to sea with Hymir to go fishing, he tears off the head of one of Hymir’s giant oxen to use as bait. The two fishermen go far out from land – both Eddas emphasize the great distance they row into the ocean. 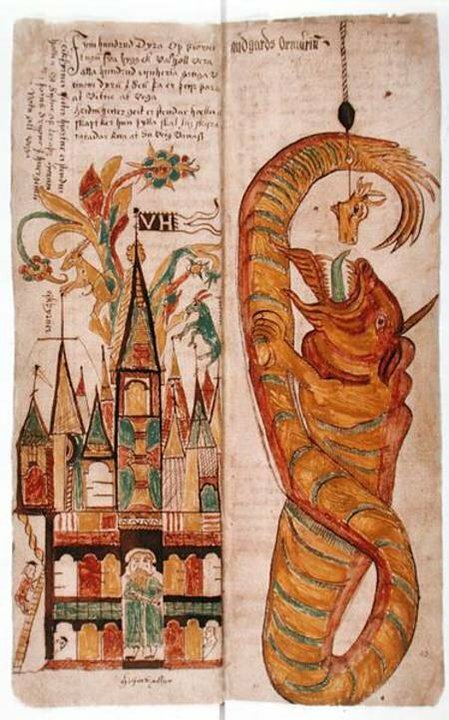 With the ox-head as bait at the end of his fishing-line, Thor snares the enormous, world-encircling serpent Jörmungand. The thunder god struggles mightily to land the creature, pulling so hard on the line that his feet go through the bottom of the boat and push against the sea-bed. The thrashing of the serpent causes giant waves to crash over the boat and “all the ancient earth” to collapse; Hymir panics and cuts the line. As Jörmungand sinks back into the waters, Thor throws his mystic hammer into the water after the serpent. The name of the ox is Himinhrjód (“heaven-destroyer”) or Himinbrjoter (“sky-cleaver”). This seems like a very grandiose and threatening name for a member of the domesticated herd on Hymir’s lands. The name makes more sense if we see the ox-head as a poetic image for a meteoroid, a boulder from space that cuts a fiery path through the night sky as it burns through the atmosphere. Reading metaphorically, the fishing line that trails behind the head is the tail of the meteor – the line of burning gases and particles that draws a glowing streak across the heavens. This interpretation also explains why Thor rows so far out to sea. When was the last time you had a meteor land in your back yard? “Falling stars” almost always appear to fall a great distance away. For the inhabitants of Iceland (the original writers and readers of the Eddas), “far away” meant out over the vast waters surrounding their island nation. Jörmungand’s real role in the tale is simply to provide narrative impetus; he gives a reason for Thor to row out to sea and serves as the catalyst for all of the cosmic events that follow. In Norse mythology, Thor’s mystic hammer is often a symbol for the lightning bolt thrown from the clouds. In this tale, the hammer can be seen as a second meteor that burns through the night sky, seemingly chasing the first. 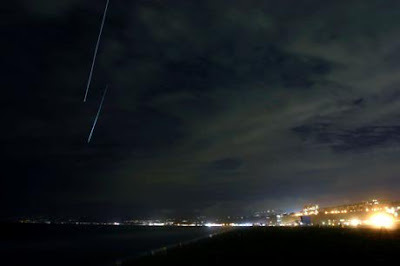 Meteors often arrive in showers; they seem to originate from a single point in the sky and fly through the atmosphere on parallel paths. In the older, Germanic version of Thor’s hammer, the weapon is actually a stone wedge that the thunder god hurls – a burning physical object that buries itself in the ground. 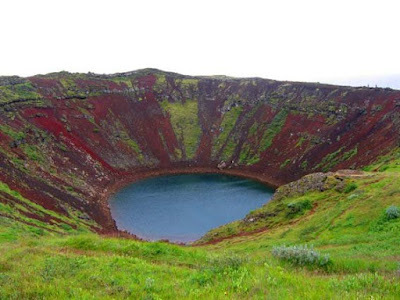 Perhaps the very origin of the mythical hammer was in the smoldering meteor rocks that ancient peoples found in impact craters after they fell from the sky. Giants most often represent overwhelming natural forces, and Hymir is no different. Elsewhere in this same tale, he proves to have a head as hard as a stone; Thor smashes a crystal goblet against Hymir’s skull and the giant suffers no damage. Hymir is also the owner of a gigantic brewing-caldron that is fully a league deep. Both of these attributes connect Hymir to the natural world. He seems to be made of stone, which links him to the rocky terrain and mountains of the Nordic lands. The gigantic cauldron is, perhaps, a poetic representation of a crater lake – a large body of water formed inside a volcanic crater, such as Kerið in Iceland’s Golden Circle. then there sank back that fish into the sea. It seems that the threat to “rock-monsters” (giants) and “stone-fields” (the abode of giants) is what motivates Hymir to action. He is protecting the abode of his people, the giants that live in places inhospitable to humanity. This is one of the cases in Norse mythology where a giant is not necessarily an enemy to humans. Hymir is actually protecting the natural world from the unbridled wrath of Thor, who is so possessed by rage and hatred for Jörmungand that he is completely heedless of the effect his actions are having on his surroundings. 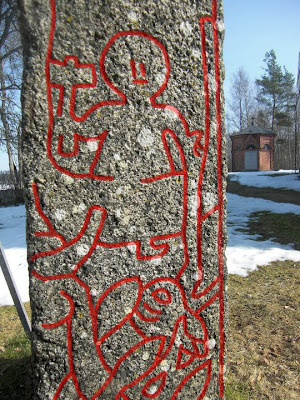 As with the stone hammer, this hearkens to an older conception of Thor as a terrifying sky-god, rather than his later incarnation as the protector of the common man. Like much of his etymology, Jacob Grimm’s dissection of the name “Hymir” is a bit suspect. However, it does provide an alternative Ent-omology (“study of giants” – not a real word). He links the name to Old Norse and Old High German words for “twilight” and “sleep.” The god Týr says that Hymir “the very wise” lives “at the end of heaven,” and Grimm points out that the giant is referred to as “the old.” This all suggests that Hymir is an ancient sky-god of some sort, in direct conflict with the god of thunder. From this perspective, Hymir represents the night sky; when he cuts the fishing line, we see the end of meteor’s tail trailing behind it. Some myths can be interpreted as explanations of religious ritual, and some provide mythic context for the mores and morality of their parent society. 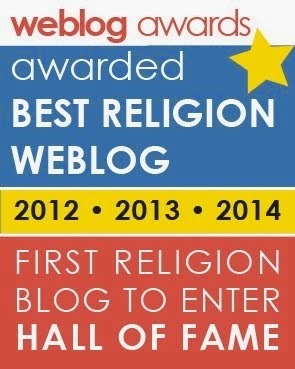 The story of Thor’s fishing trip fits best into a third, cosmological category. It explains the phenomenon of the meteor shower in a way that ties it together with multiple elements of the Norse mythological conception (gods, giants, monsters). 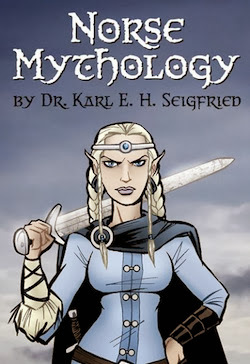 A fine example of a Norse “Just So Story,” it provides an explanation for a celestial event that is internally consistent with the logic of Norse cosmology and demonstrates how “myth science” helped pre-modern cultures to understand the natural world. "Like much of his etymology, Jacob Grimm’s dissection of the name “Hymir” is a bit suspect. However, it does provide an alternative Ent-omology (“study of giants” – not a real word)."